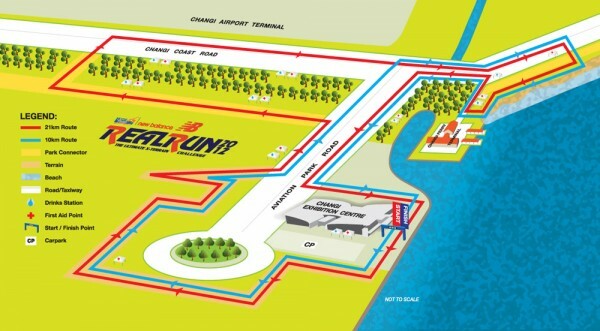 New Balance Real Run 2012’s starting/finishing point was at Changi Exhibition Centre. Flag-off time was 6:30am for 21km runners and 7am for 10km. 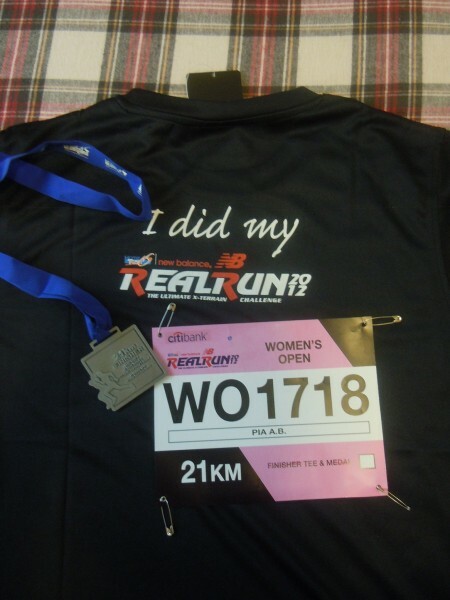 I joined the 21km race, and it was my first time to do so. I was nervous. I initially planned to take the cheaper way of going to the venue which was by a bus provided by the organizer from Toa Payoh Stadium, it’s supposed to cost $3 when purchased during the road show and $5 on the day itself, but, I realized I didn’t want to rush and exert too much effort to start my day, hence, I just decided to take cab, which cost me $30. Anyway, I didn’t anymore mind paying for this comfort because I knew I’d already be “torturing” (in a good way) myself once the race starts. 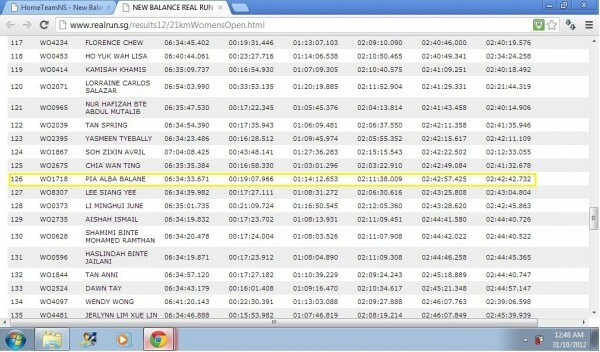 There were less people during this race unlike all the other races I’ve participated in. Later today, I was informed that the Nike Race 2012 also happened on the same day and time as this NB organized race and I guess, that explains why. Bag deposit wasn’t free as well. Runners had to pay a dollar for it. About 6am I went into the starting area. Every one patiently waited for the sound of the official gun and as soon as this most anticipated sound was heard, every one ran with all their alacrity. I told myself, I wouldn’t rush with them. I wanted to maintain a steady and comfortable pace just so I can finish the race comfortably and injury-free. I was basically slow, but proud to say, I “jogged” the entire time, I didn’t walk. I didn’t stop. Route included 2km trail, 17.5km concrete road and 1.5km sand. Running on sand was formidable. The beach shore was uneven and was slanting more on one side hence; this caused more pressure on my left knee/leg. Good that it was only 1.5km. While running, I realized why they always say ‘running is a mental sport’ and it’s basically because it would really test your patience and perseverance. A while ago, the last few kilometres were the toughest, not only because it was drizzling but also because at this part of the race, mentally, I slowly found my rational-self questioning my adventurous-self ‘why am I doing this again?’ and I just kept reminding myself that I, personally, wanted to try this at least once in this lifetime! And this thought kept me sane and going. Seeing the finish point from afar was like seeing a long lost relative I longed to see and missed so much. I was so ecstatic; I wanted to kiss it as soon as I could. This entry was posted in Uncategorized and tagged happy, runs. Bookmark the permalink.